Gold and blue are the colors of the University of California. The gold is the gold in California's hills and the golden color of those hills in summer. The gold also represents the wealth created in the valleys and the cities of California that made possible the development of a great public university on the West Coast that became the greatest state university system in the United States. The blue is the blue of Yale. Yale alumni initiated the university. Yale blue also represents the long history of evolution of universities in the western world since 1100 when the University of Bologna began. The University of California has inherited that long tradition and built upon it. Gold and blue, blue and gold: in another sense the blue stands for the difficulties and the gold for the triumphs in building this system to its present levels of distinction. The university's academic and administrative affairs make up its "private" life; the internal and external political contexts that condition so much of its environment are the university's "public" life. The two are generally separate. The private life unfolds largely in silence and most directly affects members of the university community. The public life takes place in the open, through the media, and also involves interested persons among the general citizenry. This public life is the primary view of the university by the outside audiences. These two lives are mostly subject to their separate sources of initiation, their disparate casts of characters, their divergent paces of development, their distinctive internal dynamics, their contrary sets of motives--during the 1950s and 1960s, for example, the inquiries of the California legislative Committee on Un-American Activities were hardly noticed internally. But the two lives are to varying degrees intertwined--most intimately in the loyalty oath controversy after World War II, the student revolts of the mid-1960s, and the intervention of Governor Ronald Reagan in the late 1960s. How could the University of California be so much more successful in its private life of academic accomplishments than most other research universities while, comparatively, so much more tossed and tortured in its public life? How did it avoid being destroyed? *** To recount my part in each of these partially self-contained worlds, I separate my memoirs into two volumes. The first, Academic Triumphs, is mostly concerned with the private life of the University of California, which has been one of the centers of my life for over sixty-five years. By way of introduction to part I, chapter 1 sets out how I came to know Berkeley as a graduate student and young faculty member. Chapter 2 is a retrospective on Robert Gordon Sproul, president of the university from 1930 to 1958, and the administrative structure he had created by 1952, when I became the first chancellor at Berkeley. Chapters 3 through 10 form part II, relating to my years as chancellor. The book's part III takes up the years of my presidency of the university, which in 1958 had six campuses and, by 1967, had nine. The second volume, Political Turmoil, covers the political contexts, both external and internal, of my years as chancellor and president within which the university had to function, from the oath controversy through the student revolts to the reaction of the Reagan administration. This book ends in 1967, when my presidency of the university ended. I identify the memoirs as "personal"--even very personal. They are not a formal record of these years. They are, rather, my perceptions, as a participant and observer, of what was going on. I saw some, but not all, of what was happening, and what I saw was from the point of view of an interested partisan. I write these memoirs for the possible interest of those fellow participants in the great transformation in the University of California's life from 1952 to 1967--faculty members, staff members, alumni--who may still be interested in the development of that history of which they were a part. I also write for current faculty, staff members, and alumni, and for those students who may be curious about what went before. I realize, of course, that the 1950s are as long ago now as the 1910s were when I became chancellor. At that time I had only some idle curiosity about Benjamin Ide Wheeler's presidency as a crucial background to the 1950s. Ancient history! The 1950s are only yesterday for me, but ancient history for the students of the 1990s. As I record my perceptions of one period in the life of a single institution, I hope also to contribute to the broader history of higher education in the United States during the years 1950-70. What was happening in California was also happening to American higher education generally, but often sooner and more dramatically here. The University of California has been and is today an avant-garde segment of the larger national entity. To look at the University of California is to look at some aspects of the nationwide transformation writ large. In order to provide some information on what was happening inside the university and within the larger context, I have included a number of tables, charts, and appendices. These in no way set forth a complete picture of the University of California or of higher education during the years in question, but they do reproduce information and pull together relevant data that are not now readily available elsewhere. I also write these memoirs as a devoted University of California faculty member of more than fifty years' duration who was, once upon a time, otherwise engaged. What follows, then, is an insider's account of how Berkeley and the whole University of California responded to the McCarthy period of political life in the United States, to changing labor markets, to the advanced role of research on campus energized by the Cold War and the influx of federal dollars, to the oncoming tidal wave of students requiring new academic and physical plans, to the student revolts of the mid-1960s, and, perhaps above all, to the need for new visions of the future. The results were both turmoil and triumph. Nineteen fifty-two had not been the very best of years to inaugurate chancellorships at UCLA and Berkeley--particularly at Berkeley. The regents had divided bitterly over the loyalty oath controversy. The president of the university found himself in a weakened position vis-à-vis many of the regents and even some of his once loyal faculty, as a result of his initiation of the loyalty oath and then his retreats in reference to it. The faculty had grown disheartened and discouraged, and politically sensitized. As chancellor, my central approach was to see that there were no more conflagrations--not if I could help it. My efforts landed me in several skirmishes. I felt I had to be always on the alert and ready to intervene to the extent I could. The series of responses to one of the major themes of the times (anticommunism) set forth below began before my years as chancellor and continued into my presidency. My successful attempts to heal old wounds also opened new ones that festered until my dismissal as president in 1967 and continue even to this day. When Ray Allen and I became the first chancellors at UCLA and Berkeley in 1952, we were introduced into a supercharged atmosphere of a divided board of regents and a divided faculty, and more so at Berkeley than at UCLA because the oath controversy had been more concentrated at Berkeley. As the more liberal of the two chancellors, I was also the more vulnerable to criticism from the conservative factions in the state and in the Board of Regents. And, as a liberal, I was also subject to special criticism from Berkeley's influential radical left. The regents were more touchy on some issues that came before them than they might otherwise have been and so, potentially, was the faculty. The "Red Chancellor" of the "Red Campus"
I encountered many minefields and exploded several anti-personnel mines, the legacies of which profoundly affected my chancellorship and my university presidency after 1958. One of the first was a confrontation I began with the California Senate Committee on Un-American Activities (the Burns committee) the very day I was introduced as chancellor to the Berkeley community in Dwinelle Plaza. It happened on the day of the first university meeting of the new academic year-October 1, 1952. President Sproul had just announced my appointment as "contact man" with the state senate committee. I expressed my reservations about the arrangement and never did, in fact, so serve. But my antagonistic, and very distant relationship with the state committee lasted throughout my period in university administration. It also made my relationships with President Sproul and Vice President Corley more uneasy. I reserve until later (Political Turmoil) my account of this complex and most regrettable story when I set forth the intertwined internal and external political environment of those years of McCarthyism and its repercussions in California. I walked straight into this conflict with the most powerful reactionary force in the state (the Burns committee) with my eyes wide open. In the wake of the oath controversy, a second obstacle was McCarthyism's chilling effects on free speech and association among faculty members. Several (perhaps ten) came in to see me as chancellor, one by one, asking for my permission to join one group or another, or sign one petition or another, or give one speech or another. In each case I would say that the decision was their own, not the chancellor's. I would add, however, that if I were in their place, I would do exactly what I wanted to do as a free American citizen. After the first few such inquiries, I decided to set an example. An initiative to place the Levering Act oath adopted by the legislature in 1950 into the state constitution was before the voters of California in the fall of 1952. It passed with more than a two-thirds majority (2,700,000 to 1,200,000).1 A group of Bay Area Quakers was opposing this initiative for inclusion in the permanent constitution of the state and asked me (also of the Quaker persuasion) to join them. I did so in public pronouncements. I knew the possible consequences and they came quickly, including several from regents. The most dramatic was at the next meeting of the board. The chair of the board (Edward Dickson) came to my office and seized me by the coat lapels. He said I was being viewed as the "Red Chancellor" of the "Red Campus," and he wanted me to retract what I had done. I refused. I said that I had acted as a citizen in an off-campus context; that I had not given up my rights as an American citizen when I became chancellor; that I never would; and that the regents should know this. Regent Dickson turned his back to me and walked away. A third issue was the pressure being put on librarians around the state to acquire only politically acceptable books. A lecturer at Berkeley (Marjorie Fiske) published a study on the subject, suggesting that the pressure came from conservative groups. I considered this charge to be very likely true. At one of my first meetings with the board as chancellor, several regents wanted to do something to her in retaliation. What that action might be was never made clear. I defended her and prevailed. A fourth controversy concerned the California Labor School, an allegedly Communist front activity (and I agreed that it was from my knowledge of it and its sponsors), which was going out of business and wanted to give its archives to the university. This raised some strong opposition within the board, again at one of the earliest meetings I attended. I defended acceptance on the grounds that historical records should be preserved, and again I succeeded. A fifth issue arose, after the California State Supreme Court ruled the university loyalty oath invalid (October 17, 1952), over the question of back pay for the nonsigners. I immediately supported back pay in discussions with the regents (at their meetings on November 21, 1952, and January 20, 1953) on the grounds, in part, that the courts would subsequently require back pay in any event. I based this argument upon my experience in industrial relations. I also argued that for the board, on its own, to grant back pay would be a gesture welcomed by the faculty and would help bind up the wounds. Some agreed. Some disagreed. Others thought it was "wiser" for the courts to so rule than for the board to so act because the latter course of action would arouse needless controversy within the board and in some quarters externally; and so my effort failed. Later, however, back pay was agreed to by the board (March 1956) as a case brought by the dismissed faculty members lay before the Superior Court in Sacramento. I also tried personally to persuade nonsigners to return, promising that they would in no way be discriminated against. A sixth obstacle touched on tenure for a faculty member in political science (Harold Winkler). His colleagues in the department voted to deny him tenure, although the chair of the department supported him. Shortly after that action, Winkler addressed a student group at the Hillel Foundation (the center for Jewish students at Berkeley) and was reported in the press to have urged students to consider joining the Communist Party. The reports on what he said were subject to dispute, and his actual comments were never fully clarified. The reports, however, drew headlines. The issue of dismissing Winkler forthwith first came up at a meeting of the board to which I had not been invited. Some regents reacted violently to the reports. They may have remembered that Winkler had been one of the "not cleared" nonsigners, affecting their strong initial reactions. President Sproul postponed a vote to the next meeting of the board (January 29, 1954) and said I would be specially invited to attend. Here was another case in which a difficult issue came up; the universitywide reaction was, "That's why we have a chancellor," as with the "contact man" idea and several other issues. The president did not commit himself, either when inviting me or later, when I asked him what his position would be. I finally rode alone with him in the elevator at the Crocker Building in San Francisco where the regents occasionally met and were meeting that day. I told him I really had to know his position. He said that he would give me a chance to argue against dismissal but he thought I should know in advance that I would lose. I was terribly worried. Friends had warned me that the Berkeley faculty was becoming aroused, that another minor oath controversy might be in the offing. I had taken the precaution of visiting Regent Neylan in his baronial castle on his estate in Woodside. I had gone over the case with him and how the university should act most carefully-no more oath controversies. At the board meeting, I argued that Winkler had spoken off campus as an individual, that he had a right to his opinions, and that his future at the university had already been determined on academic grounds and thus that any action by the regents would be both redundant and very distressing to many faculty members. When the vote was taken I did not lose and Regent Neylan ended up voting with me-in fact, he introduced the motion to accept my report. Only the chair of the board (Regent Dickson) voted "no." Winkler, of course, was furious. He was not a heroic martyr (like Mulcahy in Mary McCarthy's Groves of Academe), but an academic reject. Another controversy started with the federal government's ruling that all Reserve Office Training Corps (ROTC) participants would be made ineligible if they belonged to any one of a long list (approximately 200) of suspect organizations ("the attorney general's list"). ROTC was still compulsory for freshmen and sophomore men in the university, and that meant that any such participants would become ineligible to continue as students. When the issue came before the regents, the president once again declared that this was a campus issue and that he had referred it to the chancellors. I said that the list was very suspect; that to dismiss some male students would be discriminatory because women and foreign students were exempted; and that, moreover, the federal government had no right to interfere with the constitutional authority of the university to govern itself. A majority of the regents agreed. Regent Neylan stated to the board that, while he had voted against my position, he admired my willingness to stand up and state my position while others had refused to do so. His oblique references were to Chancellor Allen, who had left the meeting early to return to UCLA (the board was meeting in Santa Barbara), and to President Sproul (Neylan was pounding one nail into the chancellor's coffin; another was for the cross onto which he had already been nailing Sproul). The minutes of the Board of Regents (September 24, 1954) record that "Chancellor Kerr was commended for his prompt and courageous action in dealing with the situation." Had we started dismissing students or even seriously considered the possibility, many other students would have risen in righteous wrath; also some faculty members-including me. Yet another obstacle arose from an attempt to stop faculty contacts with the FBI: a faculty member (David Rynin of philosophy) in May 1958 asked the Berkeley Academic Senate to declare "not permissible" any reports by faculty to the FBI or other investigative agencies on "the beliefs, attitudes, activities and associations of a student regarding religion, politics and public affairs." This broad proposal took specific aim at comments to FBI agents. It was referred to the Committee on Academic Freedom chaired by Frank Newman of the law school and became a project he sponsored. The proposal was accepted at a lightly attended senate meeting on October 28, 1958. The regents were alarmed and particularly the most liberal of all regents, Jesse Steinhart. He thought it was a "gag rule" affecting faculty freedom and was a "police state approach." Many faculty agreed. I was also alarmed and objected to the proposal on the senate floor. I asked: were there any actual abuses? None were alleged. And did the Academic Senate have any authority to so control individual faculty contacts and conversations? The attorney for the regents ruled that it did not. Then I asked: how could the university go about enforcing such a rule? There was no answer. And last, I noted that, in my experience, faculty comments were almost always helpful to students in such circumstances-universally so in my own experience. I thought it better to leave such matters to the individual judgment of faculty members. Frank Newman came to see me the Sunday before a subsequent senate meeting to discuss the proposal. We talked in the patio at my house outside my study. He said that I would "shoot him down in flames" and that he wanted me to know that he would not put up much resistance. That is the way it finally turned out. The action of October 28, 1958, was rescinded on May 25, 1959. But passions for a time did run high. Regent Steinhart at the next meeting of the regents complimented my actions. An unpleasant confrontation between the senate and the regents had been avoided. In most of these cases, and others, I was doing my best to guide regental and faculty actions away from any new controversies that would arouse highly sensitized participants. No more oath controversies or even shadowy reflections of them! I would try to step in between. I was vulnerable in the atmosphere of those times. I had committed a number of "sins" from the point of view of right-wing regents, faculty members, alumni, and legislators. These "sins" were brought to my attention then and later, including in a series of interviews by federal security agents, particularly after the Radiation Laboratory at Berkeley came to be placed under my nominal supervision. (Actually Ernest Lawrence reported directly to the Board of Regents.) I needed (and obtained) a "Q" clearance, which was the highest level of all. As a graduate student at Stanford, I belonged briefly to the Walrus Club when it petitioned (early fall of 1932) to become affiliated with the League for Industrial Democracy associated with the Socialist Party of Norman Thomas. I had met and liked Norman Thomas at Swarthmore. Debates at Swarthmore were not only with teams from other colleges (including Oxford and Cambridge) but also with national leaders. In the latter category I drew, as captain of the debate team, Norman Thomas (spring 1932). My faculty coaches claimed that I had won the debate held in the Friends' Meeting House, but the important thing for me was the favorable impression I had personally of Norman Thomas. In the election in November 1932, however, I turned my political sympathies to the New Deal and voted for Franklin Delano Roosevelt; but I very briefly did have a "socialist" connection-very democratic socialist and very anti-Communist (the Communists called Norman Thomas a "social fascist" as they did me much later when I was at the University of Washington). As a graduate student at Berkeley, I worked with Paul Taylor (see chapter 1) who was considered a "radical" by conservative agricultural interests in the state. Actually Paul was a radical conservative-he wanted to go back to the kind of 160-acre family farm where he was raised, and so did I. On the 140-acre farm in eastern Pennsylvania where I was raised, we were at least half self-sufficient in providing our living. Paul came from Wisconsin and Iowa. All his life he stayed with his vision of the return of the family farm. I did too, as an ideal, but came to think that the future in California, realistically, lay with the "factories in the fields." Paul and I wrote a report on the bloody cotton pickers' strike of 1933 in the San Joaquin Valley, for which I did most of the fieldwork.2 If there were a definitive event marking the transition in California from Thomas Jefferson's (and Taylor's and my) vision of the independent yeoman farmer as the backbone of democracy to the agricultural factory operator with transient laborers, it was that strike. In 1945 I became the first director of the Institute of Industrial Relations at Berkeley. This was an institute started on the initiative of Governor Earl Warren, who got the idea from a similar institute Governor Tom Dewey of New York had initiated at Cornell. The institute was the first agency of the University of California (except for one lecturer in University Extension long before) to establish teaching contact with organized labor. The leaders of several employers' associations in the Bay Area called on me, warning that if the institute kept on working with the trade unions, they would use their influence to cut off our funding in Sacramento. I replied that I hoped they would reconsider and decide against doing this; but, if they went ahead, I thought they would not succeed. If they did succeed, I was prepared to take the consequences. They did, in fact, reconsider. A further challenge to me and to the institute came at a conference at the Ahwahnee Lodge in Yosemite Park, where representatives of employer associations from southern California, including the powerful Merchants and Manufacturers Association-more anti-union than in the north-were present. Congressman Richard Nixon preceded me as a speaker. He associated trade unions with communism. In my reply, I associated them with the American right to freedom of assembly and said that, with a few exceptions, they were implacably anti-Communist; and this view has been verified by history. As my associate director of the institute, I chose Lloyd Fisher. Lloyd had one of the best minds I have ever met. It flowed so freely, like mercury, and was a delight to observe as he went from idea to idea and discipline to discipline. Lloyd, however, did not have a Ph.D. and thus was handicapped in academic life. John Dunlop, a professor at Harvard and later dean of the faculty of arts and sciences, and I later arranged for him to attend Harvard and get his degree. He wrote a brilliant dissertation that the Harvard University Press published in 1953, The Harvest Labor Market in California. But Lloyd, before joining the Institute of Industrial Relations, had been research director for Harry Bridges and the ILWU. Because Bridges had been under investigation as an alleged Communist subject to deportation, many people jumped to conclusions about Lloyd. I had never seen any such implications-quite the contrary. One clear indication to the contrary came shortly after World War II during a meeting in New York in which we both participated. We attended, on Lloyd's initiative, a presentation of Arthur Koestler's Darkness at Noon-a devastating portrayal of Stalinist destruction of an "old Bolshevik," allegedly Bukharin. It was a play Communists hated. Lloyd occasionally jokingly referred to himself as a "theoretical, nonpracticing anarchist." He was both-doubting but not attacking all authority. Lloyd was one of my very best friends at Berkeley and I admired him greatly. He was a free-thinking skeptic who doubted all ideologies. For an exposition of my general views on economic issues at that time, see my chapter, "An Effective and Democratic Organization of the Economy," in Goals for Americans,4 which was included in the report of the eleven members appointed by President Eisenhower of a commission so named, which included James Conant, president of Harvard; Crawford Greenewalt, president of DuPont; General Alfred M. Gruenther; Judge Learned Hand, and myself, among others. I supported a system of checks and balances in the economic system to parallel the political checks and balances in the American constitution. I note this as a statement of my centrist position at a time when I was subject to suspicions of radicalism. Additionally, I served (1946-47) as Impartial Chairman for the Pacific Coast Waterfront from Canada to Mexico. It was said by some that I had been "Harry Bridges' arbitrator." Actually, I arbitrated between the ILWU and the Waterfront Employers Association, under an appointment made by the United States secretary of labor. When you worked in between those enemies at the time of the "old look" of class warfare, you were a long way away from anybody. To illustrate the atmosphere: One day the case placed before me was a reopening of the contract on wage issues. I asked if the parties had tried to negotiate the dispute between themselves. They looked at me as though I did not know the waterfront and said, "Negotiate?" I added that I might be somewhat old-fashioned, but that negotiations should precede arbitration, and I would not accept the case until they had negotiated. They reluctantly agreed. So I got up to leave. They said, "Sit down, this won't take long." So I sat down. Frank Foisie for the waterfront employers said: "Mr. Bridges, we do not know what you are going to demand, but, by God, the answer is no." Bridges replied: "To tell you the truth, Mr. Foisie, we have not yet finally decided on our demands but, by God, we will never take no for an answer." So the parties turned to me and told me that here was my case, that they had negotiated! I was really arbitrating on behalf of the U.S. government on behalf of peace on the waterfront under conditions of class warfare, which I totally rejected in a democracy. I once ordered the rough, tough ILWU to live by a contract to which it had orally agreed but tried to get out of on the grounds it had never formally signed it. And it did live with it for a whole year on my order. Also, as the regents well knew, I had opposed the dismissal of "nonsigners" who had refused to sign the "regents' oath." I was a signer. I was sympathetic with those Quakers who would not take any oaths but I never saw all that much difference between an "oath" and an "affirmation" that they would make instead. I had signed oaths before when working for the U.S. government. In fact, I considered, and continue to consider, the U.S. Constitution to be the greatest nonreligious document in world history. I voted in 1950 in favor of the position taken by the Academic Senate against employment of faculty members who were proven members of the Communist Party under the conditions then surrounding party membership. I did not look on the "nonsigners" as suspect people. As I knew them, and as was confirmed in their appearances before the Committee on Privilege and Tenure on which I served, they were independent people who did not like to be pushed around and did not like to be singled out as suspicious characters. I understood the type well. My father came from a family of pioneers in the Appalachian mountain valleys of central Pennsylvania where his ancestors had homesteaded (Raccoon Valley, Perry County) before the American Revolution. He was a totally independent spirit. He hated FDR for subjecting farmers to federal controls. He believed that nothing should ever be unanimous. He would vote "no," on principle. He would let any tramp sleep in our barn with a caution not to light a fire and also would give him a warm meal. But when the principal of the high school where my father taught, in addition to running our farm, asked for "100 percent support" for the Community Chest, my father would each year be the one person to refuse. At Berkeley, any actual Communist would be among the first to sign the oath-and at least three did, as I describe later (Political Turmoil). I quietly arranged for their immediate resignations when President Sproul told me he had received full proof of their memberships. It was the independent free spirit that refused. Thus I had been an opponent of the pro-oath regents who wanted to and did fire all the nonsigners. In addition, I was irate that the regents had gone back on the agreement to permit an affirmative appearance before the Committee on Privilege and Tenure as an alternative to signing the oath. In the world of industrial relations from which I came, the one cardinal sin was to repudiate an agreement. In that "jungle," this was almost never, never done. My very few responses of anger in my life have been when I thought agreements or informal understandings were being broken. These were among my vulnerabilities at that time of American "red hysteria" and of conflict within the university. They help explain why, as chancellor, I wanted to live in my own house and to continue my teaching and writing. To retain my sense of integrity, I had to be prepared to be expendable. Kay, with a strong Quaker heritage from the maternal side of her family, agreed. I had to be willing to take a stand against the regents or against the faculty or between the faculty and the regents to try to hold them off from renewed conflict, and not just to stand aside and let conflicts intensify. These vulnerabilities, of course, came back to haunt me when Senator McCarthy and the FBI were followed by the Un-American Activities Committee of the California State Senate and by Governor Reagan. I earlier raised the question of why President Sproul proposed my appointment as chancellor (chapter 3). A related question is why the Board of Regents accepted it at that time in history. My guesses have been, first, that after the oath controversy, the regents were inclined, as a gesture of conciliation, to accept a faculty-originated nominee at Berkeley; and, second, they did not expect the position at Berkeley to amount to much. Two pro-oath regents (Ahlport and Neylan), however, did abstain in the vote appointing me. Let me return for a moment to Regent Dickson. He was publisher of a newspaper in Los Angeles-the Evening Express. He was a member of the Board of Regents for forty-three years (1913 to 1956)-longer than anyone else in history. At the next board meeting one month after the encounter I noted above where he referred to me as the "Red Chancellor," he came up to me. He said he had been thinking about what I had said and had come to agree with me that I should never give up my rights as an American citizen to speak out. He added, however, that he wished I would be more discreet and that, if I were, I could have a great future within the University of California. We became good and respectful friends but were still not in full agreement. In any event, I felt sympathy for Maggie in Cat on a Hot Tin Roof. Berkeley felt like a hot tin roof from time to time during those years, and I felt vulnerable. When I became president of the university in July 1958, I continued to be concerned that the oath controversy be put to rest once and for all. I took several actions. It had been burned into my soul that only the University of California faculty, among all the great universities in the United States, had no recognized right of lifetime tenure-that it was the annual contracts that were not renewed for nonsigners during the oath controversy. I began immediately to work informally among the regents, as the new president, to develop support for the first formal continuous lifetime tenure policy in the history of the university. By the September meeting of the regents (September 18, 1958), I was ready to move and introduced a proposal calling for "continuous tenure" with dismissal only for "good cause" after a hearing by the appropriate committee of the Academic Senate. The regents voted unanimously for this in December. Regent Jesse Steinhart, in particular, was enormously helpful. Regents Edward Carter and Don McLaughlin were also very helpful. During the discussion in September, Carter had said that this action would "close an ugly chapter in university history." It did, in part. It never occurred to me at the time that I would be the first beneficiary of continuous tenure. After I was fired as president, and over the objections of Governor Reagan, the regents returned me to my professorship on the grounds that I had continuous tenure. I also proposed to the regents an honorary degree for Edward Chace Tolman, distinguished professor of psychology and a nonsigner of the oath. Approval was not a foregone conclusion. The case against the regents for the dismissal of nonsigners was Tolman v. Underhill (Robert Underhill was secretary of the regents). It was incomprehensible to some regents that anyone who had sued the regents would be given the university's highest honor. To make this possible, it was necessary for me to get a change in the rules from unanimous consent for honorary degrees to a three-fourths majority vote in secret ballot. Regent Pauley took this especially hard because of his support for the oath but also because he thought that the senior regent (which he by then was), in particular, should have a right of a personal veto. The regents approved the honorary degree for Tolman, and I was proud to confer it on him on March 20, 1959, my first Charter Day at Berkeley as president. I later persuaded the regents to name Berkeley's new education and psychology building Tolman Hall (1962). This action of mine had substantial consequences. It began a long battle for survival between Regent Pauley and me. Pauley was very determined about his standing as senior regent and his asserted possession of certain privileges. He hated my action in taking away from him one of these claimed privileges. Later I proposed a policy of rotating chairs of the board. Pauley thought that the senior regent had a lifetime claim to chair of the board, as had been the case with Regent Dickson. My proposal was accepted. Pauley detested this outcome. He made me his number one enemy. He began charging me as being "pro-communist." I always thought that his opposition was really based on his view that I was anti-Pauley. He did serve twice as chair of the board but never on a lifetime basis. To him, being chair of the board was the crowning glory of his life, and I took it away from him. He was a devoted and, in many ways, a good and supportive regent. He was also an alpha male par excellence,and I had challenged his dominance, and I was never to be forgiven. In the end, he destroyed me as president. In the meantime, however, the Board of Regents operated in a more civilized manner than it would have with Pauley as lifetime chair of the board. During the oath controversy, the dean of the law school at UCLA (L. Dale Coffman) had supported the pro-oath regents and had referred to the law school at UCLA as "an island in a red sea." As a reward, and with the acquiescence of President Sproul, Coffman got the regents to take from the Academic Senate the right to approve of the UCLA law school's courses or to review its academic appointments and promotions or budget proposals (January 1952). The law school at Berkeley then received the same exemption. As chancellor at Berkeley, I told the dean of the law school (William Prosser) that I could get advice from any source I wanted and that I would always want it from the Academic Senate, and I always insisted on it in practice. The feeling that I had infringed upon the school's autonomy lasted for years. As president, I got the regents to put both law schools back under the Academic Senate with one exception. The exception was the review of courses by the Committee on Courses. I made this exception because the Committee on Courses seldom really reviewed any courses (it mostly just approved whatever was presented to it)-and because the law school, in any event, had its own entirely separate curriculum and student body. I wanted the law schools fully back in the senate not only because I valued senate advice, but also because I wanted law school faculty to be fully accepted in the affairs of the senate and in the governance of each campus. A law school faculty member later became chancellor at Berkeley. I also did not want other professional schools to attempt similar escapes. Some regents argued that senate power over professional schools mitigated against "excellence of our professional schools" (Regent Carter at Board of Regents meeting, May 18, 1962). This was a common complaint of professional school deans and of Chancellor Murphy at UCLA. I argued that "the pressure of the Academic Senate is always in the direction of distinction, not the contrary." This view prevailed. In these several ways, the oath was finally put to rest. Or was it? The two most active regents who later on worked for my dismissal as president of the university were the two remaining pro-oath regents, Edwin Pauley and John Canaday. There were some costs. 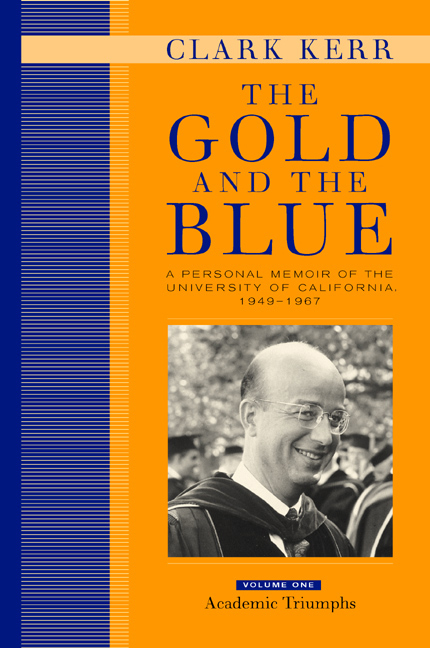 One of the last century's most influential figures in higher education, Clark Kerr was a leading visionary, architect, leader, and fighter for the University of California. Chancellor of the Berkeley campus from 1952 to 1958 and president of the university from 1958 to 1967, Kerr saw the university through its golden years--a time of both great advancement and great conflict. This absorbing memoir is an intriguing insider's account of how the University of California rose to the peak of scientific and scholarly stature and how, under Kerr's unique leadership, the university evolved into the institution it is today. In this first of two volumes, Kerr describes the private life of the university from his first visit to Berkeley as a graduate student at Stanford in 1932 to his dismissal under Governor Ronald Reagan in 1967. Early in his tenure as a professor, the Loyalty Oath issue erupted, and the university, particularly the Berkeley campus, underwent its most difficult upheaval until the onset of the Free Speech Movement in 1964. Kerr discusses many pivotal developments, including the impact of the GI Bill and the evolution of the much-emulated 1960 California Master Plan for Higher Education. He also discusses the movement for universal access to education and describes the establishment and growth of each of the nine campuses and the forces and visions that shaped their distinctive identities. Kerr's perspective of more than fifty years puts him in a unique position to assess which of the academic, structural, and student life innovations of the 1950s and 1960s have proven successful and to consider what lessons about higher education we might learn from that period. The second volume of the memoir will treat the public life of the university and the political context that conditioned its environment. Clark Kerr (1911-2003) was President of the University of California and a giant in public education. His books include The Uses of the University (1995), Higher Education Cannot Escape History (1994), Troubled Times for Higher Education (1994), and The Great Transformation in Higher Education (1991). 3. Answering the Big Question: Who Will Take Berkeley's Place in the Academic Big Six? 5. "The Best Balanced Distinguished University"